Seasonal depression, also known as seasonal affective disorder (SAD), is a type of depression caused by seasonal changes, mostly during the winter. SAD usually starts and ends at the same time of the year and has a recurring pattern. Children are most likely to suffer from SAD as compared to adults. Just like any other form of depression, SAD can exist as severe, mild or anywhere in between. Many parents only become aware of the difficulties their children are facing when it is too late. Spend quality time with your children so you can get to know them better. Learn about the major symptoms of SAD and carefully monitor your child’s behavior. It is important you spend time with your children as it keeps them from feeling lonely or isolated. Bringing home a movie or spending a little extra time with them after lunch strengthens your bond with your children. This will encourage them to seek help from you in times of need, rather than shunning away their problems and isolating themselves when times get rough. Has your child been daydreaming excessively these days. Do they seem unusually cranky during the winter morning? To prevent your child from getting depressed, make sure they get enough sleep. Not getting enough sleep can hinder your child’s productivity at school. It can cause them to further get into trouble with their teachers and peers. The last thing you want is for your child to face difficulty concentrating during classes. Encourage your children to stick to their daily bedtime routine. This will help them perform better during the day and will also reap mental health benefits. To encourage your child to sleep early, try to follow a regular sleeping schedule as well. Getting enough time in the sun can reduce your child’s risk of suffering from seasonal depression. Exposure to sunlight increases the production of a chemical called serotonin in your body. Low levels of serotonin are greatly associated with depression. Encourage your child to go outdoors and increase their exposure to sunlight. Installing florescent light bulbs and fitting lamps in every corner of your home can also decrease the symptoms of SAD. It can get pretty dark during the winters, so make sure your house is well lit at all times. Try and increase their levels of vitamin D if the time of day they can go outside is limited. People benefit from extra vitamin D in the winter anyway. Ask your doctor what a recommended dose for your child would be. One of the most prominent symptoms of seasonal depression is loss of appetite. Not getting enough calories can further decrease your child’s energy levels. Make sure your child is getting a proper balanced diet. Increased carbohydrate intake can cause your child to get sluggish and lethargic. Limit consumption of sugary snacks and introduce healthier snack options. Keep your kitchen and pantry stocked with healthy goods so your kids have something healthy to snack on whenever they feel hungry. Prevention is better than cure. Help your child learn more about SAD without overburdening them with too many details. It is unlikely your child will want to read complicated health articles with you online so just help them understand the basics. Creating awareness will help your child spot signs and symptoms of SAD by themselves. You can then take them to the doctor at the earliest and take precautionary measures. Seasonal depression is something that needs to be taken more seriously. Many people confuse SAD for mood swings and do not take the required measures soon enough. 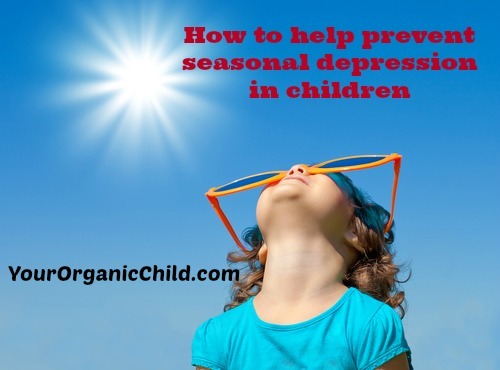 To prevent your child from suffering seasonal depression, create a positive atmosphere at home. Whenever your child is feeling down or depressed, talk to them and try to help them look at the brighter side of things. Perk up your house with colorful posters and bright colored accessories that will help lift your child’s spirits in even the darkest of winters. You can encourage your child to start writing a gratitude journal that will help them cherish all the good times they have spent. This will prevent them from feeling lonely and upset. As far as Vitamin D, below is one of the brands I give my children. I was told from their doctor for viitamin D to have good absorption you should have your child take their vitamin D with a fat such as milk or eggs or any other fat.